Fried chicken is delicious, but it’s not very healthy. Add to that tonight is Halloween, and nobody wants to spend the entire evening in the kitchen. 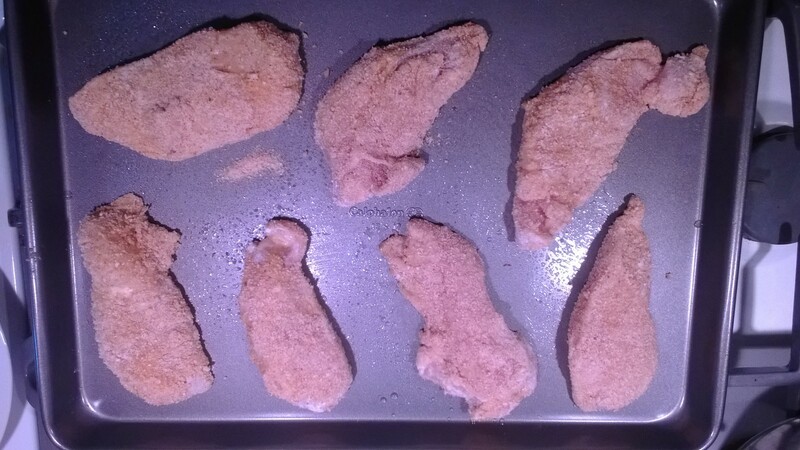 Not Fried Chicken Strips are fast, they’re not only not fried, they aren’t the least bit greasy and you can flavor them to whatever you’re in the mood for by adding seasonings to the bread crumbs. 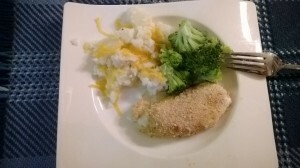 A perfect meal for the family on the move, this is Team FitNice’s favorite recipe for breaded, not fried chicken strips, which taste wonderful and make sure the meals on any table are good for everyone. 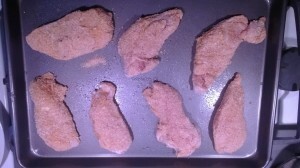 Once cooked, the chicken strips can be dipped in ketchup, chopped up for a salad or baked with parmesan cheese to satisfy even the pickiest palates. They also make leftovers for another dinner or a lunchbox. There you have it! 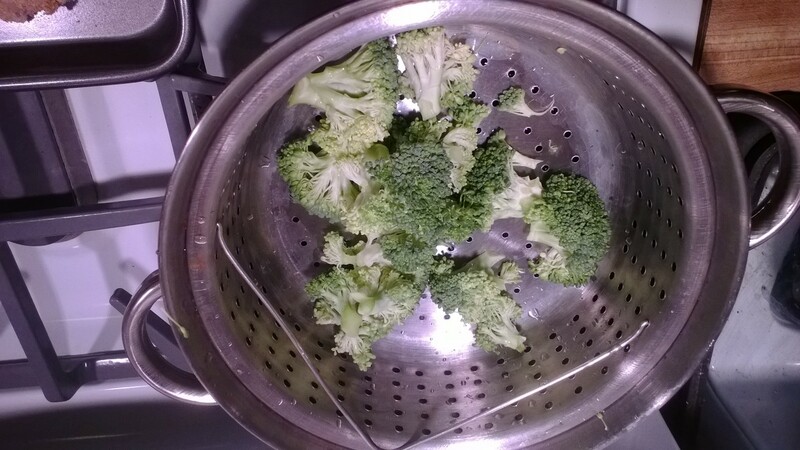 Quick, easy and healthy, Not Fried Chicken Strips with Steamed Broccoli is a great weeknight meal that is fast, low carb, low fat and good for you! 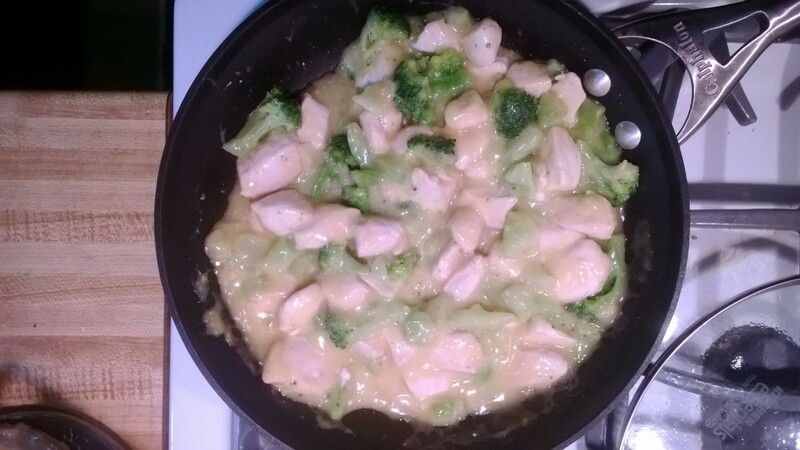 This entry was posted in Nutrition, Recipes and tagged chicken, low fat and low carb, recipes, weeknight meals on October 31, 2013 by meredith@fitnicept.com. Protein is the most important building blocks in our bodies, and often meat is the main source of protein in a human diet. As a complete form of protein, meat offers the most nutritional bang for your buck. To get the most benefit from eating meat, it’s important to choose lean meat. The United States Department of Agriculture (USDA) requires lean meat to be any 3 ounce serving with less than 10 grams of total fat, 4.5 grams of saturated fat and 95 milligrams of cholesterol. Extra lean meat is also available and contains less than 5 grams total fat, 2 grams saturated fat and 95 milligrams of cholesterol in a 3 ounce serving. Turkey, fish and skinless chicken breasts are great options for putting lean meat into your diet, you can also choose lean cuts of beef and pork. Ground round is the leanest type of ground beef, with ground sirloin, ground chuck and regular ground beef following it up. When selecting beef, always aim for at least 90% lean, with 95% or 97% being ideal. If you’re not in the mood for beef, you can still keep lean meat in your meal without being forced to eat chicken, turkey or fish. Pork products that have ‘loin’ or ‘leg’ in the same, such as tenderloin, top loin roast, top loin chop or sirloin roast are wonderful lean meat choices. Lamb (loin chop, arm chop and foreshanks) and veal (cutlet, blade or arm steak) are additional ways to mix up the protein in your meals. Be sure to trim any visible fat from all cuts of meat and balance protein intake with other macronutrients like carbohydrates and fats. Why bother? Lean meat is full of nutrients your body needs, like magnesium, vitamin B and iron. Magnesium is crucial for building bones, while vitamin B helps metabolism and plays a big role in immune health. The iron found in lean red meat is great for maintaining energy and taking oxygen through the bloodstream. Several studies have shown that eating lean meat can improve the healthy and shine of hair, lower cholesterol and improve mood. Start filling your fridge and freezer with a variety of lean meat cuts and receive great health benefits while eating delicious meals. 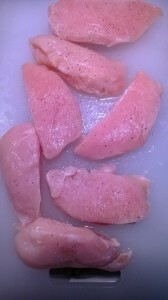 For help adding lean meat into your diet and creating a menu, contact us at Info@FitNicePT.com today! 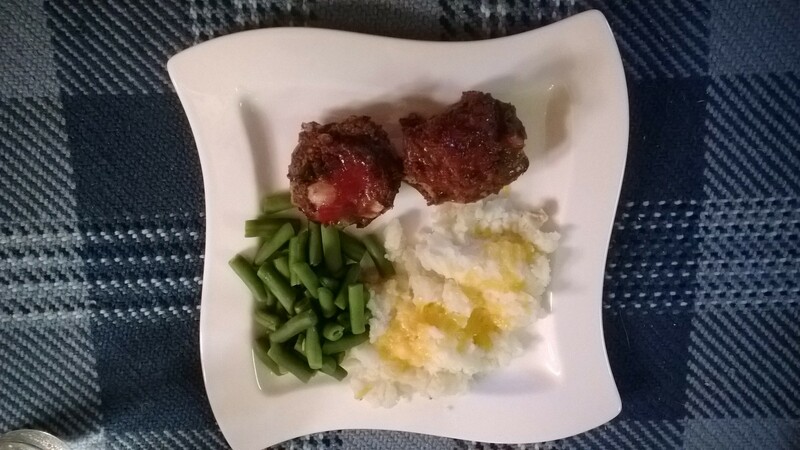 This entry was posted in Nutrition, Wellness and tagged healthy diet, lean meat on October 28, 2013 by meredith@fitnicept.com. Bored with your meatloaf? Try these single serve, easy to clean up mini Meatloaf Muffins that will delight your taste buds. Like most recipes, this one is great because you can customize the flavor based on the sides you serve with it or what you’re in the mood for. Using lean meat and fewer breadcrumbs also makes this a healthy dish. Served here with fresh green beans and mashed potatoes, this low carb, low fat dinner is sure to please. 1) Preheat oven to 350 degrees and lightly grease muffin pan. 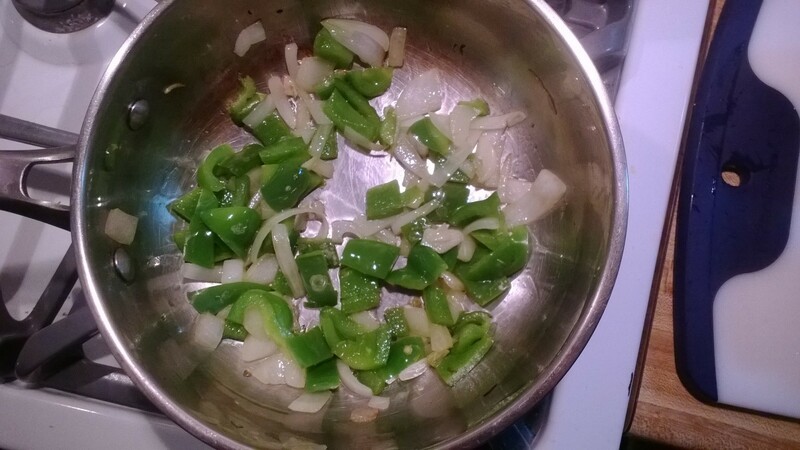 2) Pour tablespoon olive oil into skillet and saute the onions and pepper for about two minutes then remove from heat and let cool. 3) Put ground beef, garlic powder, oregano, black pepper, egg, salt, BBQ sauce, cooled vegetables and breadcrumbs in large mixing bowl. 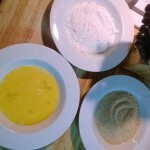 Mix by hand or with spoon until well blended. 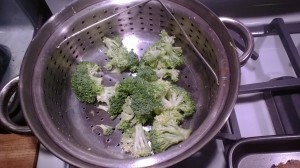 4) Place cut green beans in steamer and bring to boil. 6) Cook green beans to desired texture and remove from heat. 7) After Meatloaf Muffins spend 20 minutes in the oven, brush with ketchup and bake for an addition 7 to 10 minutes, cutting one muffin open to ensure they are cooked through (at least 160 degrees in the center). 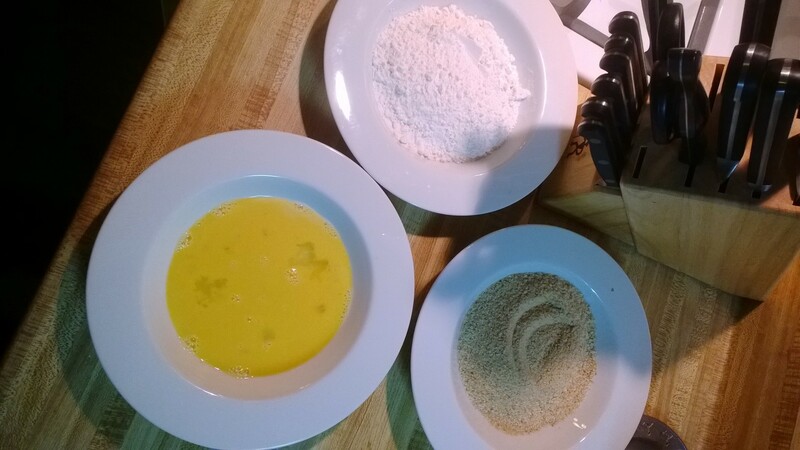 There you have a recipe for a wonderful Meatloaf Muffins. Mix up your dinner table with this fun and variable entrée. 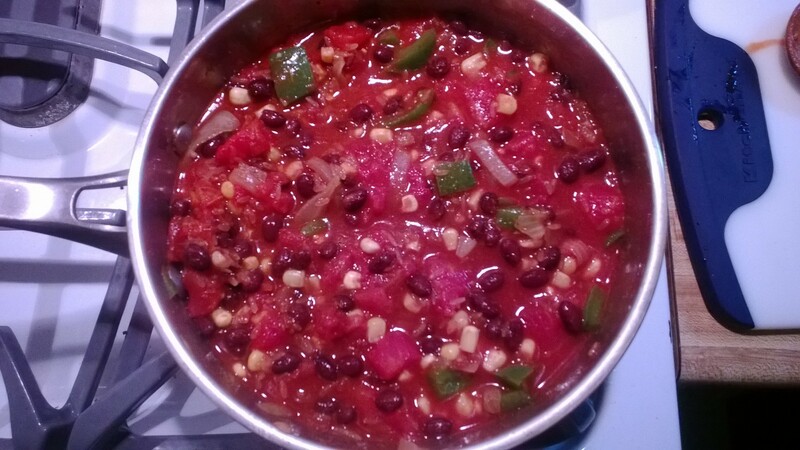 This entry was posted in Recipes and tagged ground beef, meatloaf, recipes on October 25, 2013 by meredith@fitnicept.com. Eating organic food is more than a fad, it’s been around for a long time and as it has grown in popularity, some people have made it a way of life. Organic farmers, farmer’s markets, groceries and their proponents are easy to find in any city or town. Why do these organic food lovers like it so much? Here’s a little more about organic food and a few reasons you might want to give it a try. Organic refers to the way the produce, meat and dairy is farmed and processed. Organic farming methods promote water and soil conservation while lowering pollution, unlike many commercial farming operations. Fertilizers for organic foods are natural, such as compost and manure, rather than chemicals designed to boost growth and increase harvests. Organic farmers use natural pesticides instead of chemical ones as well, and will bring in birds and insects that benefit the ecosystem while using no kill traps for pests like rodents. Due to these more expensive farming methods, organic foods typically cost more than conventionally farmed food, but depending on your reason for buying organic food, the increased expense is can be worth it. These natural farming methods also make organic food spoil more quickly than non-organic because it lacks preservatives. There are strict regulations regarding what is allowed to be called ‘organic’ and differentiating between organic and non organic foods is easily done by looking for the Certified Organic, 100% Organic and USDA Organic labels. The government requires that organic food labels meet their standards, so if it says organic, it is. The benefits of eating organic can be plentiful, from believing the taste is better to protecting the environment or eliminating chemical pesticides from your diet. While scientific evidence of organic foods’ better taste isn’t in and the jury is still out, for most it simply comes down to personal choice. Many of the studies done comparing organic and non-organic foods have focused on pesticide residue, and just as with taste science, the jury is still out as to whether there is a significant difference. You can give organic a try today by heading out to your local farmer’s market and grabbing a bag full of fresh vegetables. This entry was posted in Nutrition, Wellness and tagged eating organic, organic, organic food on October 21, 2013 by meredith@fitnicept.com. 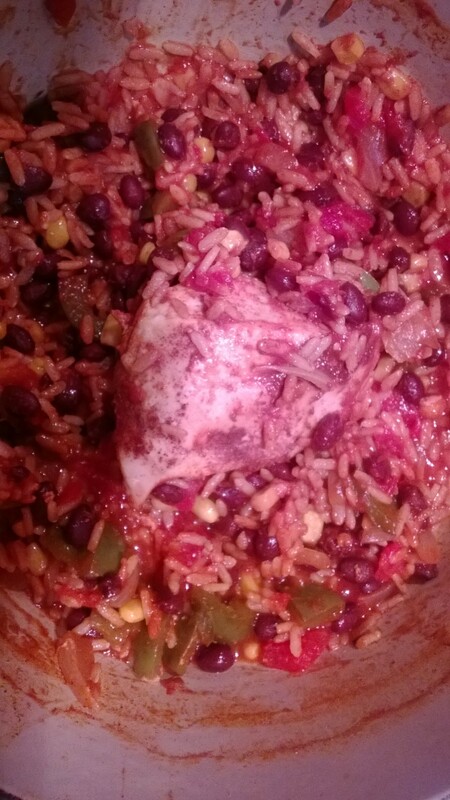 Here’s a simple, healthy recipe for a Mexican flavored Spicy Chicken and Rice bake that’s sure to please the entire family. 4. Add black beans, corn, tomato juice, taco seasoning, uncooked rice and salt. Bring to boiling. 5. Place rice mixture in 3 quart baking dish. Arrange chicken on top. Top with desired seasonings. 6. Bake covered for 45-50 minutes or until chicken is cooked through and rice is tender. The best thing about this delicious recipe is the ability to add, change or remove flavors you do, or don’t, enjoy. Try adding garlic, hot peppers or using a hot taco seasoning to increase the heat. 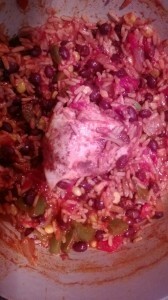 You can also use wild or long grain rice to mix it up. A hint of Mexican at home, this Spicy Chicken and Rice bake is an easy to prep, quick to cook, low fat, freezable and totally customizable recipe for every house. What are you favorite Mexican inspired dishes? How much heat do you like in your meals? 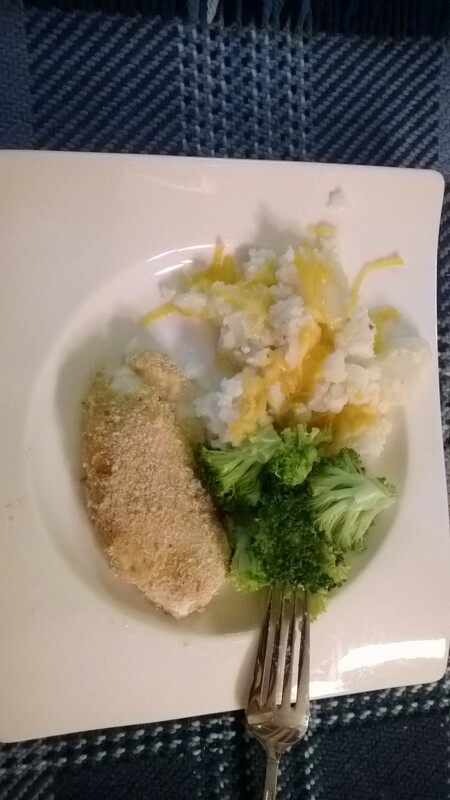 This entry was posted in Nutrition, Recipes and tagged chicken, recipes, spicy chicken and rice on October 17, 2013 by meredith@fitnicept.com. Fiber is an integral part of the human diet, and while it’s easy to get enough, most Americans don’t. Found in fruits, vegetables, whole grains and legumes, fiber is a carbohydrate that makes up the roughage, or indigestible part, of the foods we eat. A lack of fiber can result in diabetes, weight gain, overeating and constipation while the right amounts can help lower levels of bad cholesterol and risk of heart disease. Here are some tips to make sure you have the right amount of fiber in your diet and some of the best places to get it. There are two kinds of fiber and both are important to maintaining a healthy digestive system. Soluble fibers, which absorb water and slow digestion, can help you feel full and have been shown to have a positive effect on insulin sensitivity. Soluble fibers are good for helping maintain healthy weight because the food that contains them typically takes longer to chew, giving your body time to register when it’s full. Good sources of soluble fiber include oats, carrots, celery and beans. Insoluble fiber comes from fruit, dark, leafy vegetables, and whole grains. Indigestible, they travel through our guts without breaking down and help keep everything moving along. Recommended daily intake of all fibers is 25 grams for women under 50 and 35 grams for men under 50. Women over 50 should have about 21 grams per day, men 30. You can get fiber from a supplement, but the best way to meet your daily needs is through a healthy diet. The key to getting enough fiber is a diet that is rich vegetables, fruits and whole grains. When first increasing fibrous food intake, do so slowly, as it may cause intestinal gas, cramps and bloating while your body adjusts. Drinking more water is also important because soluble fiber does soak water up and can lead to dehydration. Read labels to check out the fiber content of foods, and pick those that pack a punch. You can find three of those great for you foods right here. Easy ways to add fibrous foods to your diet include eating whole grain cereals or oatmeal for breakfast, adding black beans to salads and soups at lunch and substituting quinoa for pasta at dinner. Need help adding fiber to your diet? Register for our Pamper Your Pantry Program today! Email Info@FitNicePT for more information! This entry was posted in Nutrition, Wellness and tagged dietary fiber, fiber, heathy diet on October 14, 2013 by meredith@fitnicept.com. Chicken and Quinoa Casserole is a healthy replacement for the cheesy, high calorie Mac n Chicken lots of families love so much. Very similar to the Chicken and Rice casserole everyone is familiar with, making a few easy changes turns this simple meal into something better for you, and makes great leftovers, too! 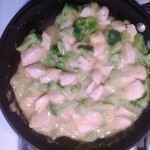 -Completely thaw broccoli and mix with browned chicken. Using frozen that isn’t thawed can make the mixture watery. Let stand to cool, serve and enjoy! 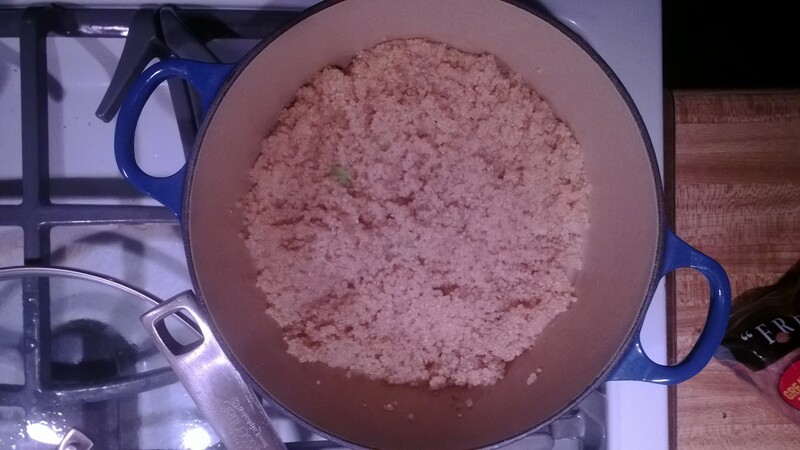 This entry was posted in Nutrition, Recipes and tagged chicken, chicken and quinoa, recipes on October 10, 2013 by meredith@fitnicept.com. FitNicePT’s very own Coach Meredith was proud to contribute to a LiveStrong piece about finding the motivation to run. Finding and maintaining the desire to get running is one of the biggest challenges she faces both as a runner and a trainer. Meredith hopes these 17 pieces of advice will help others get running right to FitNicePT so we can show them how to reach their running goals. You can read the other 16 ways to get motivated right here. If you want help reaching your next running goal, or just want to get running at all, FitNicePT is here for all of your running needs. Whether you’re new to running, struggling with a plateau, coming back from an injury or returning to a sport you haven’t thought about in years, we’ll help you every step of the way. This entry was posted in Running, Wellness and tagged livestrong, motivation, running on October 8, 2013 by meredith@fitnicept.com. Everyone wants to make healthy choices and knows processed carbohydrates like white bread and pasta are ‘bad’. Whole grains are always preferable to refined grains, because the ‘whiter’ the grain, the more processed it is, and the higher in sugar and lower in fiber it will be. Fiber is an integral part of our diets, helping slow the absorption of other nutrients, making us feel full longer and steadying blood sugar levels. You can easily substitute the pasta, white rice or bread in your meal with some of these fiber-rich, better for you, ingredients. Filling and nutritious, these three healthy choices will leave you with a satisfied tummy and healthy body. Quinoa – Quinoa is a grain-like plant that has edible seeds and humans have been harvesting this healthy plant product for thousands of years. A great source of complete protein, it is also a good source of dietary fiber and calcium. 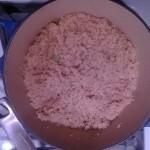 Prepared just like brown rice, quinoa is a quick and easy to addition to any meal. 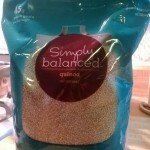 You can find plenty of recipes for your next dish with quinoa here! Amaranth – High in calcium, magnesium, potassium and iron, amaranth is a grain similar to quinoa in that it has been a part of the human diet for thousands of years. With close to 15% more protein than other grains, amaranth is a naturally gluten-free, complete protein food with plenty of fiber. Cooked like rice, it’s important to know that amaranth requires lots of extra water for the starch it releases while cooking. One of our favorite recipes, amaranth banana walnut bread, is a great way to work this healthy grain into your diet. Sweet Potatoes – One of Mother Nature’s healthiest foods, sweet potatoes are good for you, and they taste pretty OK too. A great way to get dietary fiber, beta-carotene, Vitamin C, Vitamin D, iron and magnesium, sweet potatoes can be anything from orange to bright purple on the inside. Unlike quinoa and amaranth, which are always prepared by boiling in water, sweet potatoes are versatile. This carrot and sweet potato soup, delicious any time of year, is one of our favorites and we recommend giving it a try! Roasted, mashed, boiled or grilled, these tubers are a healthy choice you don’t want to miss. Want help cleaning up your diet and planning meals? Register for our Pamper Your Pantry Program! Email Info@FitNicePT.com for more information. 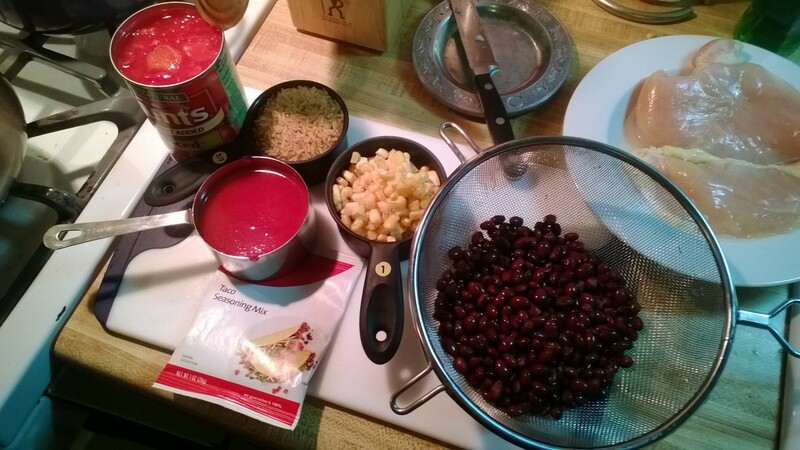 This entry was posted in Nutrition, Wellness and tagged healthy choices, nutrition, quinoa, sweet potato on October 7, 2013 by meredith@fitnicept.com.